I remember when I first got my insulin pump at age 13. I had all these ideas about how they could make it better (one of them being putting Tetris on it so it could at least be used for something fun). I remember wondering if they ever asked someone with diabetes what they want their pump to be able to do and look like. It seemed like such an obvious step. This idea of consumer/patient/community input and collaboration was a recurring theme during my Masters in Public Health program. You want someone to adopt a behavior, use a product, change their habits, you need their input and their buy-in to know if what you’re proposing is truly meeting their needs. Advisory boards, community meetings, and focus groups were written into imaginary program proposals, outlining needs and demonstrating how participant feedback would inform the program and increase engagement and adoption. On paper it all looked wonderful. Then I entered the real world. Working for a major consumer health company, I learned that the real world doesn’t always operate the way you learn about in school. I write content for health coaching programs on a variety of topics, some that I’m familiar with, some that I’m not. Ideally, when we work on a program about chronic pain or depression or insomnia, we’d be able to talk with real people who live with these conditions and really understand their daily struggles, emotions, and obstacles. But unfortunately that’s not always possible. There are short deadlines to meet. There are budget constraints. There are privacy concerns, technological limitations, and other barriers that stand in the way. Working alongside subject matter experts, behavioral scientists, and medical professionals, we often turn to patient stories found through blogs just like this one along with research to create personas that we use in developing our programs. People’s personal blogs give us a small glimpse into the life of someone living with the condition or issues that we’re writing about. Through their own thoughts and words, they paint a picture of what it’s like to live with an anxiety disorder, a binge eating disorder, COPD, fibromyalgia, etc. Their blogs bring awareness to issues that you may not read about in medical journals or CDC reports. It takes it to a personal level. It puts a face, a voice, a story to a condition. And while we still test our health programs with the people they apply to, these blogs provide valuable insight early in the process and helps us to write not just to “people with heart disease” but to Dave, a 53 year old software developer with 2 sons who after experiencing shortness of breath on a family trip, went to see his doctor who told him he had heart failure. This month is Diabetes Awareness Month. I’ve been thinking about what exactly I want to bring awareness to and why. And what I’ve decided is that there isn’t one thing I want to say, it’s everything. It’s this entire blog. It’s my life. I don’t know who reads this blog or why. I don’t know what people are taking away from it. But I hope that there are people out there like me, who for whatever reason are tasked with learning about a disease that they are unfamiliar with and in addition to getting the statistics, the symptoms, and the treatments that they find on other websites, that they also get a glimpse into what it’s like to live with the disease. I hope they walk away with a story, with a sense of the emotions that are involved, and leave just a little more informed about what living with type 1 diabetes actually looks like. There are 29.1 million people in the United States with Diabetes. Of those people, 1.25 million have type 1 diabetes. I am one of those people. 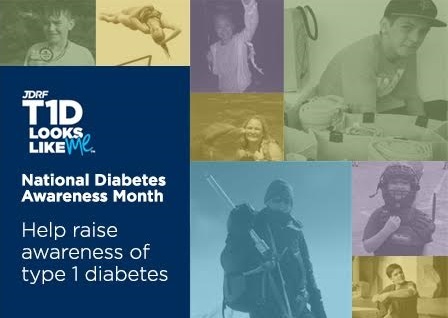 And this Diabetes Awareness Month, and every month, I want people to be able to put a voice to even just one of those numbers.